It is rare to find anyone in the annals of popular music more difficult to define than Leon Redbone. In the way he contemplates where he fits within the confines of the music industry, he is the Friedrich Nietzsche of popular music; in the way he challenges audiences, venturing against their conventional expectations of what a live show should be, he's the Andy Warhol of front porch guitar playing. More to the point, if someone is searching a record store to find a Redbone album, they may as well as visit all the musical sections because the store staff probably didn't know what to do with it. At the core of his initial career was the desire to simply honor songs from the past, which has established him as the preeminent curator of the museum of 20th century music. But over the course of his 25-year, 10-album career, the band has flirted with numerous styles ranging from classical to blues to tormented tangos to Hungarian folk music. "I extract what I consider the best material from different sources. But often the material I perform comes from a very strange location in history, which are minstrel shows," he says. Often flanked by brass or violins, he is equally comfortable performing as a monolithic solo presence. This tour includes the trio of guitar, piano and clarinet. 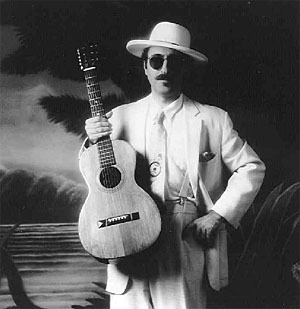 Leon Redbone's unique talent and cagey persona unfold into yet another atypical pattern. Redbone's early career first gained momentum when Bob Dylan sought him out at the Mariposa Folk Festival. In a Rolling Stone interview, Dylan mentioned that if he were ever to start a label, Redbone would be the first artist he wanted to record. Most listeners were first introduced to Redbone on Saturday Night Live, and later found him on numerous network talk shows, including the Tonight Show. The opportunity for this unlikely figure to foist himself on pop culture has been plentiful. Redbone popularized homespun jingles ("This Bud's for You?) and collaborated and performed on the award winning British Rail ads. He acted in the offbeat feature film "Candy Mountain," provided television theme songs to "Mr. Belvedere" and "Harry and the Hendersons," and had a memorable guest role as the quixotic, guitar-wielding guardian to Corky on ABC's critically acclaimed "Life Goes On." He's even been the subject of Far Side cartoons. "I think of these things as obstacles rather than opportunities," Leon modestly confesses, "because if they were opportunities it means I actually took the business of doing them seriously. To take myself too seriously is the gentle kiss of death." As if the artist needed any more serious diversity this year, he received it in the arena of dance. New York choreographer Eliot Feld has currently been performing Paper Tiger, a ballet woven around 11 of Redbone's signature songs. Apparently a conversation between Feld and Mikhail Baryshnikov included a mention of Redbone, and a phone call started the process. A few months later, a ballet was born. "Most things I get involved in usually work out that way," he explains. "Somebody makes a phone call. There's not very much in the way of initiating or soliciting from my end. It's not my forte." If there is one common element to Redbone's diverse music, it's his mastery of his constant companion: the acoustic guitar. It's easy to get lost in his stage exploits, which move between vaudeville and performance art, and overlook what an accomplished player he is. Fingerpicking is delivered with a ragtime bounce, mirroring the style of Blind Blake, and chords are leaped upon with the grace of a hurdler. Describing his playing, Redbone says, "I am totally absorbed in the business of learning, but I don't want to be an apprentice to the business of learning. I simply want to absorb everything I can and not be compartmentalized in my approach...I only know what sounds good to me."